We're honored to feature a new essay by Cynthia Close in Issue Two of Orson's Review. Issue Two of Orson's Review will be released on March 19th, 2019. We're also very fortunate for the time Cynthia took to sit down and chat with us about her journey as a writer. 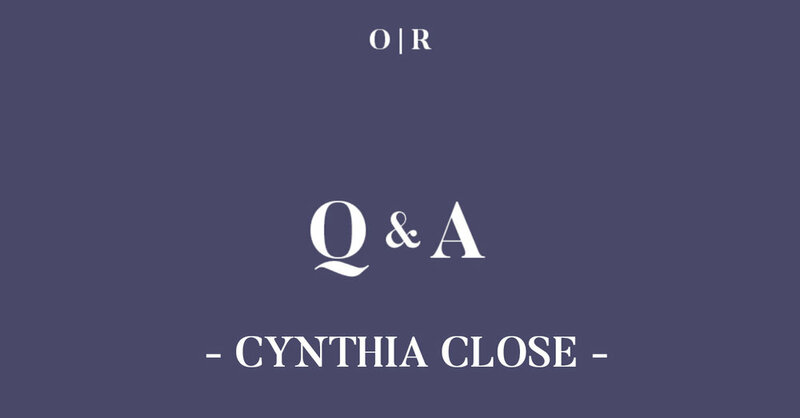 *The following interview involves Orson's Publishing (OP) and Cynthia Close (CC). CC: In 2003, I discovered blogging. It was in the early days of social media and blogging sites were usually run like private clubs. They often had free versions, but in order to comment and engage with the broader community of writers you had to pay a membership fee. I started writing on several of these sites and managed to acquire some followers. You rose in the standings the more followers you had, not unlike Twitter today. At the time I was the head of DER (Documentary Educational Resources), a well-established documentary film company in Boston. Elsevier, a publishing company that specializes in scientific and technical books, contacted me and asked if I would review pre-publication manuscript proposals related to the film industry, which I did while still at my more than full-time day job. In 2009, Tom White, the editor of Documentary Magazine, a publication of the Los Angeles based International Documentary Association asked if I’d be interested in writing for them, usually book, film, or DVD reviews. I saw it as an opportunity to write about what I did professionally, and I liked the idea of writing on assignment. I’ve been writing regularly for them ever since and they made me a contributing editor several years ago. OP: Is writing your primary occupation? OP: What about this essay are you most proud? CC: More than an essay, it feels like a tribute to a relationship over time. I attempted to honor the reality of the person, Richard, without being sappy or maudlin. OP: Tell us about your writing process. Do you approach all pieces of writing the same way? CC: Two of the most important things I’ve learned are how to work with editors and how to revise. When I first started writing, I’d complete a draft, and that was that. I’d never go back and reconsider or edit my own work. That has changed to the point where I even go back and work on pieces after they’ve been published, so I always have several versions of an essay or article laying around. I usually have six or seven or more pieces I’m working on simultaneously. The paid assignments are prioritized according to deadlines. I start with research and mull things over for a few days until I have a good opening line, something, that if I came upon it, would entice me to go on reading. Once I have an opener the rest, more often than not, flows. I love to write. I write every day. I don’t need prompts. I often feel that I haven’t lived an experience until I’ve written about it. CC: I was born on October 25th, Picasso’s birthday, and took it as an omen. I started copying Degas at 12. I always wanted to be an artist. I applied to Boston University as an art major and won a full scholarship based on my high school portfolio. I graduated with an MFA in painting. I worked very hard at being a professional exhibiting artist for the first 40 years of my life. I taught painting, drawing and design at the college level. I was the Dean of Admissions at the Art Institute of Boston back in the 1980s. I joined a radical artists commune in Austria and while living in Europe I quit being a painter, in part because I no longer believed in what I was doing. I discovered I was a better spokesperson for art that wasn’t my own and started selling other artists’ work. It was a very exciting period of life, living and working in the arts in Europe. Since I write about my life, everything has, in one way or another, impacted my writing. CC: There have been no sacrifices while pursuing my writing. My life and work are dependent on each other. They feed each other. CC: As with my writing, I’m simultaneously reading many books at any one time. Certain books I’m assigned for book reviews and as a result have made welcomed discoveries. I just started the graphic novel Berlin by Jason Lutes. It is for an assignment, but I’m the one who pitched it to my editor because I wanted to read and write about it. Some books I think I should read to call myself a literate person, like Infinite Jest by David Foster Wallace. But, I feel guilty that I can’t get past the first few pages. Generally I prefer nonfiction. I love John McPhee, and have read all the books by my dear friend, Elizabeth Marshall Thomas. I enjoyed Wild by Cheryl Strayed. I’m currently reading The Botany of Desire by Michael Pollan, Reeling Through Life: How I Learned to Live, Love, and Die at the Movies by Tara Ison, Stephen King/On Writing: A Memoir of the Craft, The Liars’ Club by Mary Karr, and Barbara Kingsolver’s new novel, Unsheltered. Some I’ll finish. I read Sherman Alexie’s latest memoir, You Don’t Have to Say You Love Me, in two nights. I’ll read anything by Margaret Atwood. She is absolutely brilliant. OP: Do you attend readings? If so, tell us about the best one you’ve ever attended–what made it so good? CC: I do enjoy going to readings and open mic nights where writers read a variety of things. Once in awhile there is an excellent writer among them. I had a great time at the Cornelia Street Café in NYC. When I attended The Writer’s Hotel, a weeklong seminar/workshop, the organizers booked us there and at the KGB Bar in the Village. I, along with fiction and other nonfiction writers read segments from our work. It was open to the public and exciting reading in such a famous venue. CC: My core literary community here in Vermont is about as good as it gets. I would like to see more overlap between writers, artists, filmmakers, musicians and performance/theater folks. The arts here in Vermont seem to function in their own bubble. When I travel to a bigger pond, like New York City, there are many more opportunities to encounter creative artists of all stripes mingling at film screenings, workshops, art openings, theater and readings at places like the Cornelia Street Café and the KGB Bar in the Village. But perhaps that Vermont bubble is why so many writers come here to write. The bubble protects you from distraction and too many outside influences. It is easy to find quiet places, surrounded by beauty where you can focus on your work. CC: No, just as I don’t believe an MFA in painting makes a successful artist, but it certainly makes a big difference providing a leg-up when you are looking for jobs to support your creative work. I may not have survived, financially, if it had not been for that MFA on my resumé. It was a foot-in-the-door, a necessity in academia. CC: I’m a reality-based person, so I believe in tenacity as opposed to crossed fingers. I truly believe the person who works hardest and doesn’t give up will eventually find success. CC: Maria Popova, who writes Brain Pickings, one of my favorite blog/newsletters, asks the question: “How, in this blink of existence bookended by nothingness, do we attain completeness of being?” All art is an attempt to answer this question. It is a search for meaning. For me, as long as I can breathe, I will be writing. There is so much to discover, so many ideas to explore, and interesting people to meet along the way. All my life I have chosen to work at things that give me pleasure without considering the feasibility of my decisions. It is a philosophy that has gotten me this far and I see no reason why it won’t take me all the way to the end. Be sure to check out Cynthia’s latest essay in Issue Two of Orson’s Review.